Crystal DG was created with two things in mind – extremely easy installation and stunning end results. 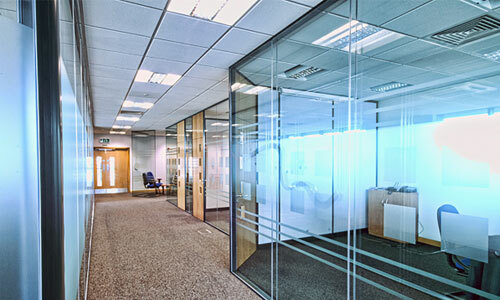 The Crystal DG office partitioning system is designed to provide elegant, full-height glazed elevations incorporating glass thicknesses from 6mm up to 12.8mm. Innovative design features are prominent throughout the range with smart clip-together sections ensuring fast site erection and cost savings, combined with extremely clean lines in appearance. Using only two sizes of the patented and unique glazing mullion gaskets CGD190 and CGD194 ensures that the two elevations of 6mm up to 12.8mm thick glass in any combination can be accommodated within the high-quality aluminium frames, providing a constant front glazing line. Crystal DG was created with two things in mind – extremely easy installation (which was always lacking in the industry), and stunning end results to please the most demanding of clients and architects. When fitted with 8.8mm and 12.8mm thick acoustic glass, the Crystal DG System has been certified to achieve a sound reduction of dB 50.